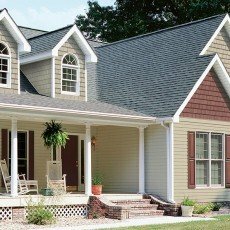 Today's vinyl siding colors cover the entire color spectrum from warm earth tones to vibrant, bold new colors. Vinyl siding is made to look like real wood so the new wood textures used on vinyl siding mimic real Cedar wood so closely you have to touch it to tell the difference. Your neighborhood is a good place to begin. What are other homeowners around you using. Find some of the nicest looking homes in your area and take pictures on your phone. Come home and discuss what others have used. Compare different homes, pick out what you like and don't like, and make notes. Note the two houses, house on the left is using clapboard siding or horizontal siding. The house on the right is using board and batten or vertical siding. These two sidings are some of the most popular sidings styles today, and have been for hundreds of years. The architectural style of your house is very important. If you live in an older home then yo may want to keep the same general color schemes that were typical in that time period. Or maybe not. Once you have looked at several homes that you really like and made notes on the colors used, you can decide which color combinations work best for you. Be sure to write all this down, make plenty of notes. Take your notes with you when you go shopping at the big box home improvement stores so you can compare different products and different manufacturers. You may have to look at several different manufacturers to find one that carries all the particular colors you like. Monogram 46 Style in Arctic Blend Color. 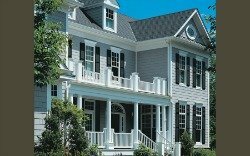 This style of siding is called Clapboard Vinyl Siding. Note how every part of the house is covered. 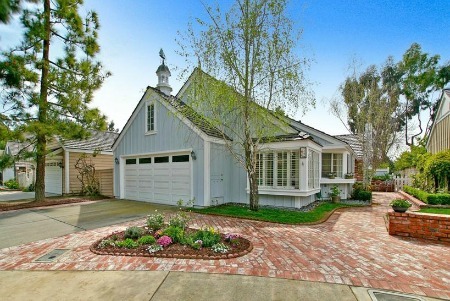 Around the windows and doors, the over-hang or soffit and even the ceiling on the front porch. This gives the homeowner many years of maintenance free living. No painting, no wood to rot, insects hate it, and it looks beautiful. 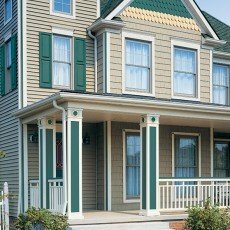 Here are a few common house styles. Note how most of the homes use more than one type of siding and multiple colors to achieve the look they want. 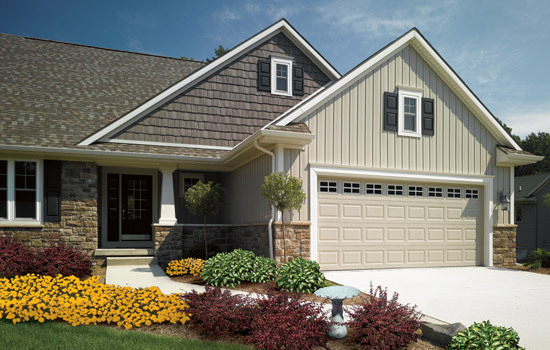 Vinyl siding colors range from warm natural earth tones to reds and blues. And every thing in between. Some siding are low-gloss and some look just like real wood. 33 different low-gloss colors for this siding. 40 different coordinating trim colors. 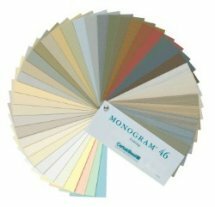 To see more on Monogram Clapboard Sidings click here. 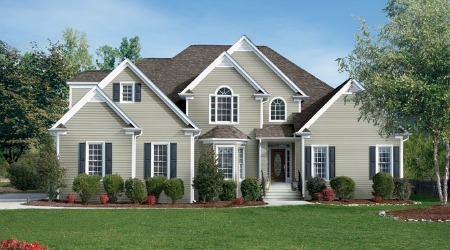 Kaycan is a major vinyl siding manufacturer and has many different colors to choose from. 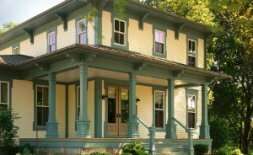 Many people use several different colors, one for the main house and other colors for trim and gables. Kaycan has a full line of vinyl siding products, click here to see more. Click here to see Kaycan's Vinyl Siding Colors Pdf.. click here. 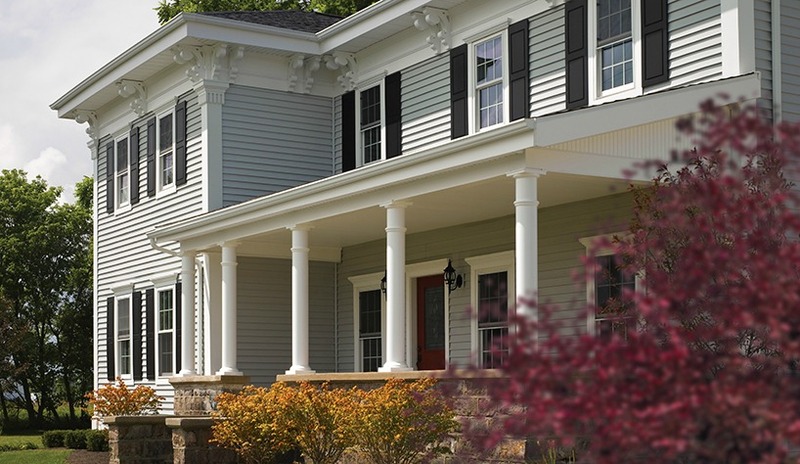 Mastic is one of the premiere vinyl siding company's. They offer a wide range of different types, styles, textures, colors and trim options. To see more of Mastic's vinyl siding colors and different styles of vinyl siding click here. Gentek offers an extensive product line of vinyl, aluminum and steel siding accessories. Gentek has everything you need to create an exquisite home exterior. To visit Gentek Vinyl Siding's web site click here. Yes there is vinyl cedar shake siding for those who want that rugged look of real cedar without the cost and maintenance of real wood siding. Dramatically textured with all the rugged charm of real cedar without the high cost and maintenance. CertainTeed Vinyl Cedar Impressions Shakes allow you to express your love for rustic, natural beauty of the outdoors. Shown here is CertainTeed Cedar Impressions Double 7" Staggered Perfection Shingles. This type of siding is vinyl cedar shake. Looks just like real cedar shingles without the high cost and maintenance of real wood. Look at many more pictures of houses using different types and styles of vinyl siding. Click here. To see more information on colors, textures and different styles of cedar shake click here. The color of siding that you choose will not affect the total costs of installing your vinyl siding so you have plenty of time to make the right decision. Just remember to write down everything in your notebook. Then use your notebook as a 'go to' for information on items you like. You will use this workbook as a quick reference when you are shopping for vinyl siding. There are so many vinyl siding colors, share with us how you picked yours. Did you and your husband fight over the colors? Who won! Do you have some pictures to add? Great! Upload up to 4 more images.